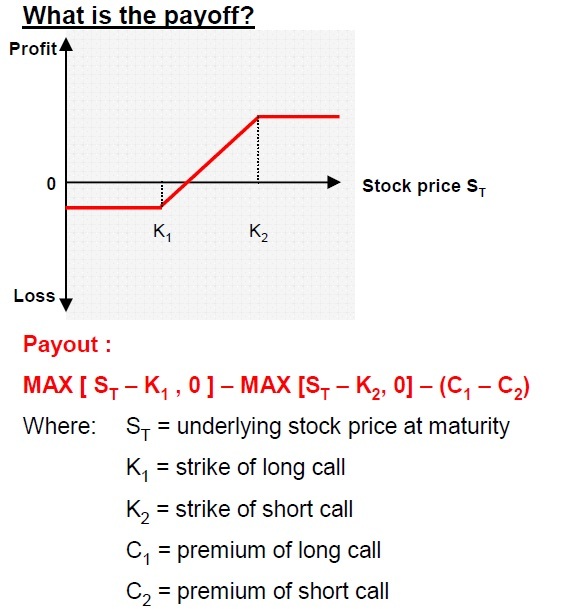 A long call spread, also known as a bull call spread is the purchase of a call option while simultaneously selling a call on the same underlying with a higher strike price. The purchase of the call is partly financed by the sale of the second call. Near identical positions can be created by a short put spread, where the investor sells a put and buys another put at a lower strike. Max profit: DIfference between strikes minus the net premium paid. Used when investors want leveraged exposure to the potential stock upside, but also see a cap to the future levels. 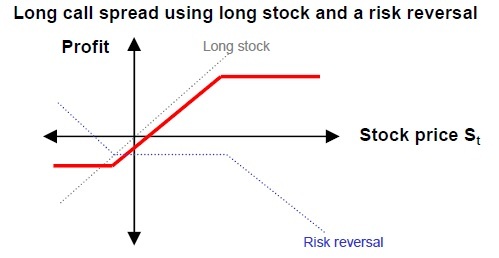 Constructed often when clients have a long position in a stock, by adding a risk reversal to an existing long position (selling a call and buying a put with a lower strike) – enabling investors to continue to participate in some upside, but also to lock in YTD gains. Sometimes used because an investor is bullish but wants less exposure to the future movements of implied volatility – vega is usually small. Cost of setting up this strategy is lower than cost of purchasing a vanilla option. Losses are limited to net premium paid, thus the loss doesn’t depend on the size of the market fall. Delta is initially quite flat meaning that any potential mark to market losses come slowly.